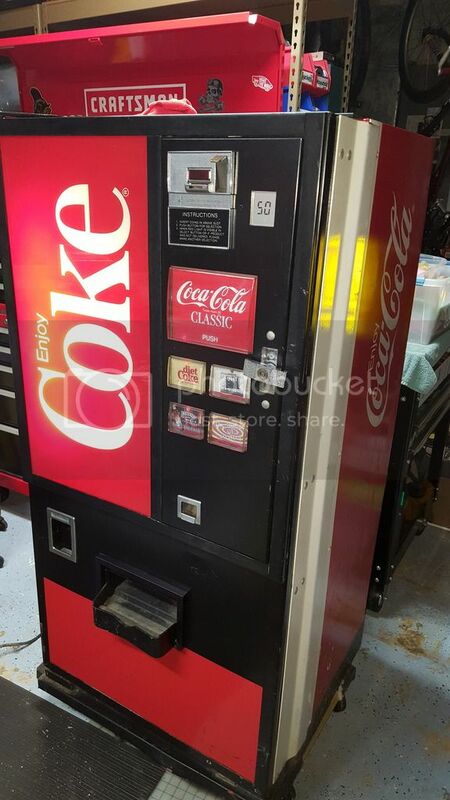 Anyone good with older coke machines? It is not on location, just my beer/soda fridge in the garage. about a year ago it froze up where it was still cold but not maintaining circulating correctly. the bottom fan is working and it does get cold... any idea what could be causing a freeze up on the top cooling grate (the one below the soda chute)? i realize the answer is more than likely "could be a number of things" but i figured it was worth a shot asking in case someone works on them a lot and this is a common thing that i could check first. ...and sometimes the baar eats you. Re: Anyone good with older coke machines? Low Freon is usually what causes coils to ice up. the right fix is to have a tech install a port (sealed from factory, at least vendolators are...), and check pressures...add freon as needed. good luck. long live coin-op soda machines. Pins: Allied Leisure, Astro Games, Atari, Bally, Bell Games, Chicago Coin, Data East, Game Plan, Gottlieb, JJP, Midway, Mr Game, Mylstar, Nuova Bell, Premier, Sega, Sterns, Williams, Zaccaria. Jukes: AMI, NSM, Rock-Ola, Rowe, Seeburg. Vids: Atari, Capcom, Data East, Exidy, Gottlieb, Midway, Namco, Nintendo, Sega, Sente, Stern, Taito, Universal, Williams. thanks everyone! i am going to get into it a bit more this weekend. it was nice and cold and the frost was minimal and i think started before i fixed the directional cardboard shroud and restarted the fan (unplugging/plugging it back in). Last night i unplugged the unit to let it completely defrost. i will deep clean the system and restart it again. the nice cold inside is a good sign, hoping it was just needing a cleaning but if not i will recharge. might do that anyway prior to sale. $300 bucks basically, either version. i dabble in soda martial arts. post the dixie narco part number, i guessed wrong with the 5 button description. the fake wood grain examples pull less money. but that pic you posted could pull $600 up, i haven't followed that design at all. 1) what freon do i add? 2) am I leaving the existing freon in and just adding or swapping completely? 3) can i just use the auto freon add kits? after looking at youtube i had more questions than answers... some guys had pro kits, so guys were using computer dusting cans, etc. etc. got the machine all cleaned up and ready to roll, just need the final freon charge. 1) what freon do i add? R12, most likely. unobtainium and expensive as a rolex...company. there is a substitute gas...also expensive, though. 2) am I leaving the existing freon in and just adding or swapping completely? topping off, but depends on numbers pulled off gauges. 3) can i just use the auto freon add kits? doubt it. 4) after looking at youtube i had more questions than answers... some guys had pro kits, other guys were using computer dusting cans, etc. etc. how were they using canned air? were they huffing it? or removing mylar from a pinball machine? i've read of people having them "charged" for $70ish bucks. might be worth looking for a tech that can do that. ... i am downsizing so the cleanup/repair was just to ensure i was selling a nice unit to a new home. Putting in the repair cost is a real gamble. i am tempted to just turn it over for the $50. don't have a ton into it (bought it 12-15 years ago for $275). Toss it on offer up for 150-200, possibly some DIY who has experience in them can fix it much cheaper. Maybe it could be just a decoration and not needed to run. I go to a lot of collector homes and they are in the corner just for showing off the rest of the collections. $50 is lowball. you can sell one part off your machine for $100 plus. i think it would move as-is for 200 bucks or maybe a bit more. no idea how the cooling mech works...could need nothing but a cleaning. $375 is too much for a repair. why would they swap a condenser out with a phone call? red flags already.